← Tournament of Classics 2017: Lizzie for the Win! Every year, Bas Bleu’s editors travel to book and gift trade shows, meeting with publishers and merchandise vendors to see their latest and greatest offerings, so that we can select the best of the best for our customers. 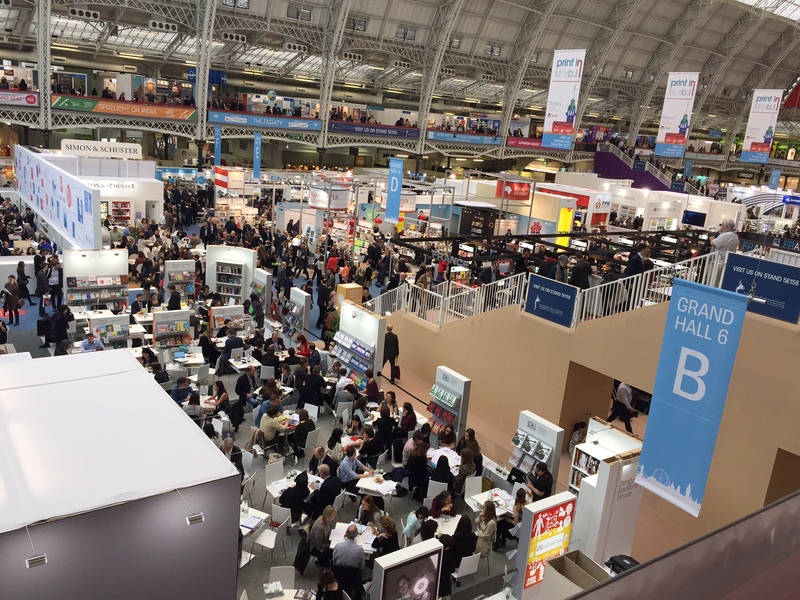 For the past few years, editor AG has attended the annual London Book Fair to check out the British publishing scene…and to do a little sightseeing. This year’s trip turned into a bit of a literary tour! 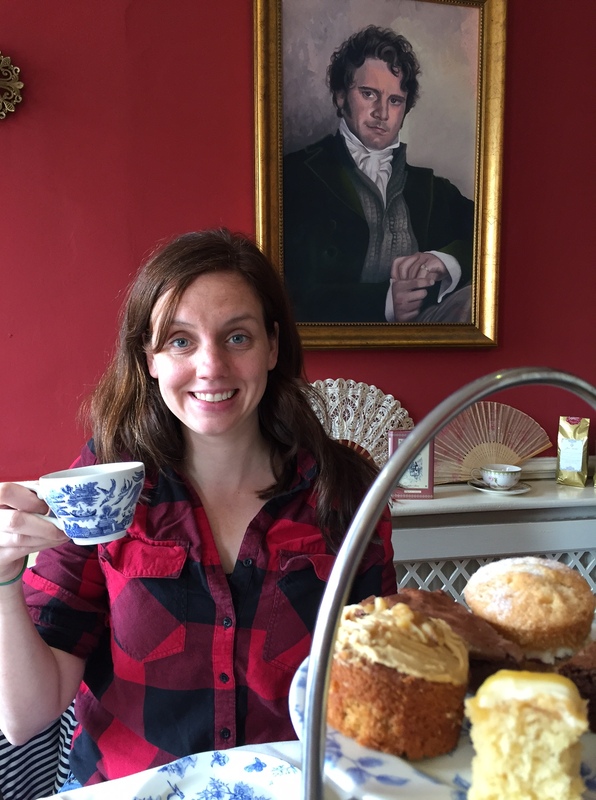 She recently returned from her adventure across the pond and agreed to share some of the highlights with us in the Bluestocking Salon. Last year when I attended the LBF, I brought the whole family with me—including my husband, our four-year-old daughter, and our one-year-old son. We had a grand time, but between snacks breaks, nap times, and exhaustion-fueled meltdowns, we didn’t quite get to see everything that we wanted to see. No visit to Bath is complete without a trip to the Roman Baths. The Celts were the first to build a shrine (to the goddess Sulis) over the hot springs. This year, thanks to the generosity of not one but TWO grandmothers, my husband and I experienced a week in England without the kids! We arrived in advance of the book fair and headed straight to the city of Bath, a short train ride from Heathrow Airport (which is easy to do, if impatient tiny people aren’t in tow). 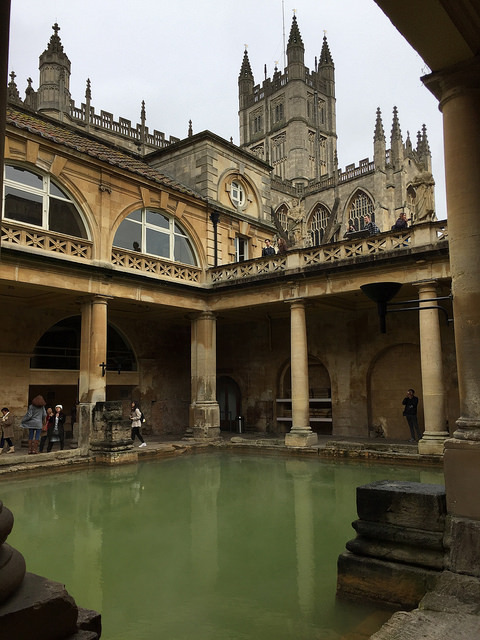 We spent a beautiful weekend in Bath, soaking up the history of the ancient Roman culture and the Gothic majesty of the Bath Abbey—we even took a day trip to explore Stonehenge! But the bookish highlight of our sojourn in Somerset was our visit to the Jane Austen Centre. 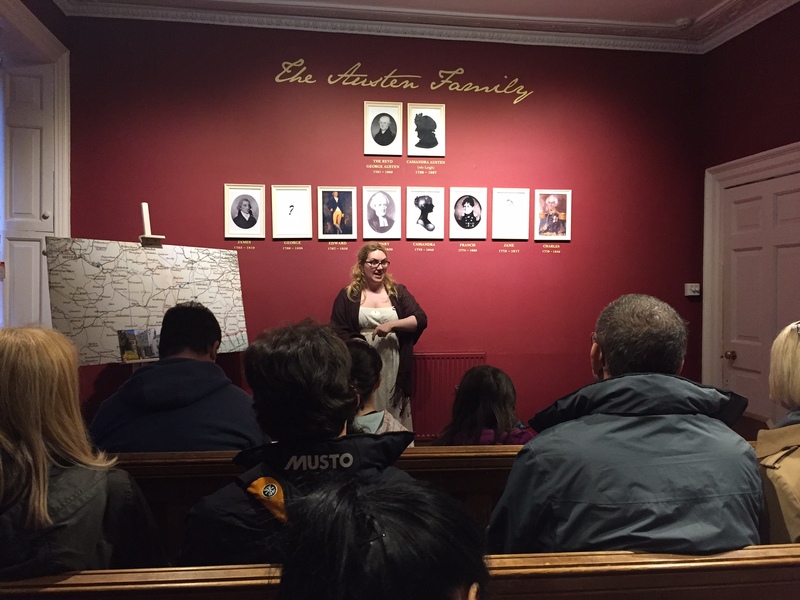 Visitors receive a quick rundown on the Austen family at the Jane Austen Centre in Bath. Located in an authentic Georgian townhouse, the Jane Austen Centre offers a wealth of info about the author and her association with the city of Bath. (She lived there from 1801 to 1806 and set two of her beloved novels in the city, as well.) 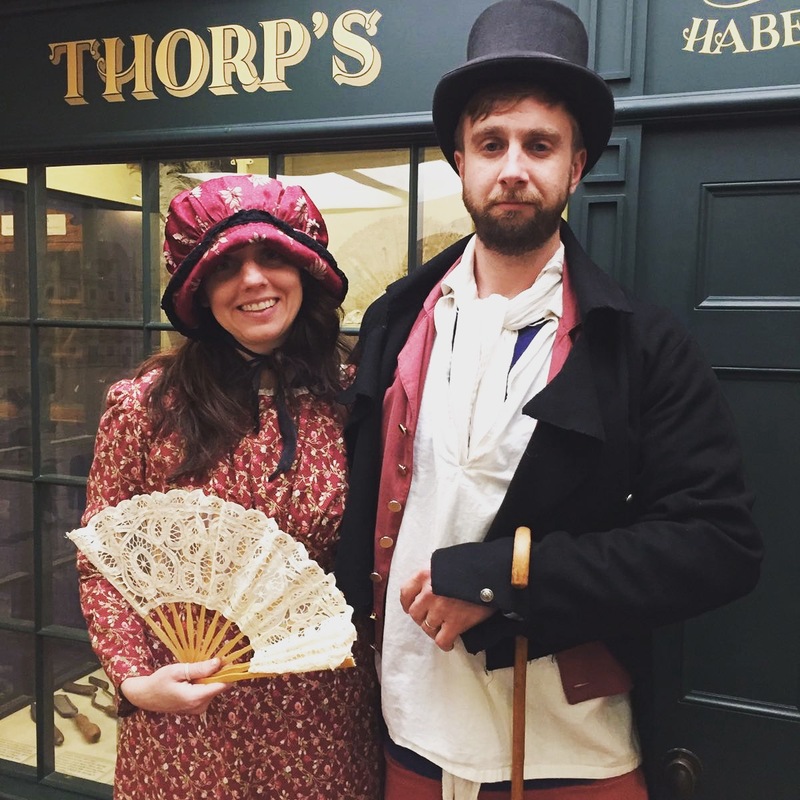 The small museum includes an interesting exhibit about Austen’s life in the city, but its true draw is the time-traveling experience—the costumed character actors, the delightful Regency Tea Room, and, of course, the opportunity to dress up in real Regency wear and pose with Mr. Darcy! I’d say we fully took advantage of our time there. 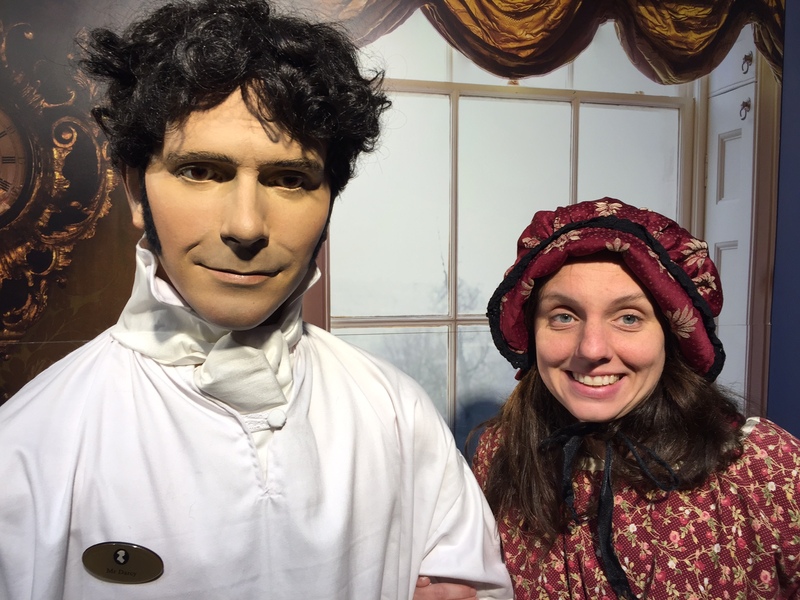 AG was thrilled to have her photo taken with Mr. Darcy! AG and Mr. AG decked out in Regency gear at the Jane Austen Centre. At the close of the weekend, we hopped a train back to the big city, dropped off our bags, and crossed the River Thames in search of Shakespeare’s Globe, an oak-and-thatch replica of the original Elizabethan playhouse. We had tickets to a performance of “The White Devil,” an entirely candlelit reimagining of a Jacobean tale by John Webster. While our play took place in the more modern Sam Wanamaker Playhouse, we very authentically chose the cheap “standing seats,” and had to crane our necks to see the stage. Despite the discomfort, we greatly enjoyed the dark drama inspired by real-life events in Renaissance Italy. After a long day exploring the Egyptian and Greek relics at the British Museum, the next evening’s activity was decidedly lighter! 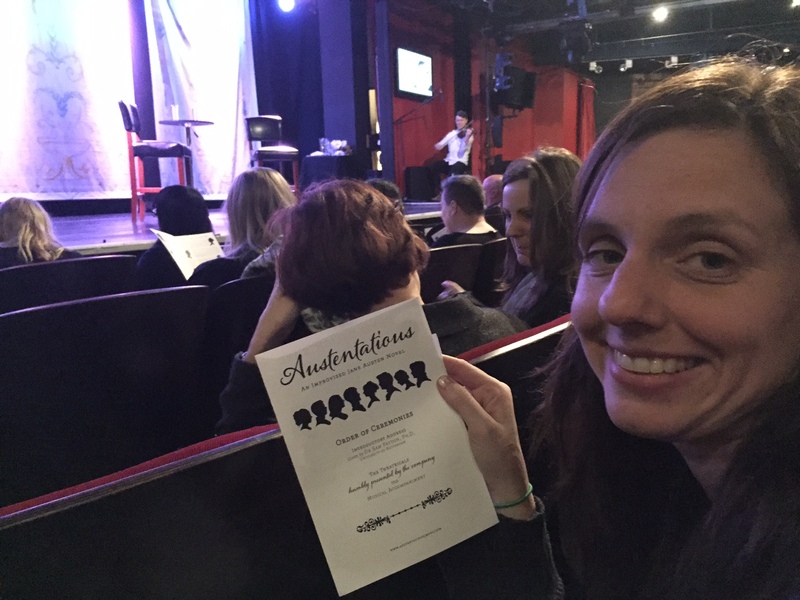 We went to a comedy theater to see a Jane Austen improv group. You read that right: Jane. Austen. Improv. In a special performance to coincide with the London Book Fair, the improv troup Austentatious culled a packed house for suggestions for the title of a “lost” Austen novel. Which is how we came to be watching a brilliant comedy of manners entitled Trump and Trepidation, wherein Mr. Trump and Mr. Spicer vied for the hand of young Miss Sanders, as Miss Conway doled out questionable advice. The audience loved it, and we Americans were particularly struck by how deeply familiar the Brits were with our country’s political happenings. Then, of course, it was time to get down to business: the book fair! I had a day filled with meetings with publishers and wandering the floor looking for British titles that might resonate with our audience. I think I found several good bets for our upcoming catalogs. (Great finds from last year’s trip include: Orchids on Your Budget, Quips, Quotes and Retorts for Oldies, and Trial and Error.) I hope you think so, too! An aerial view of the crowds at the 2017 London Book Fair. 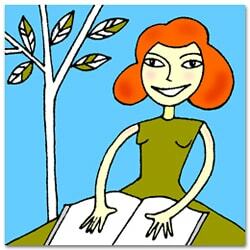 Surprisingly, there are very few people sitting around reading books! This entry was tagged Jane Austen, Pride & Prejudice, travel. Bookmark the permalink. They made the most of it that they could, complete with instructions from the rest of us to take plenty of photographs so we could share them with our readers! I fell in love with Bath during the Jane Austen Festival a few years ago. I love the tea with Mr. Darcy! I sat with him brooding down on me too. I can’t wait to see what the finds from the LBF were. I interned for Bloomsbury one semester in college and I love Brit Lit! We were fortunate enough to live in northern Yorkshire for 5 years and I was able to travel all around England during that time seeing what I wanted, didn’t want, book fairs, and many wonderful sites–never enough time!! I Love the UK! Thank you for all the British titles!!! Sounds like a dream, Terry. Thanks for sharing, and thanks for supporting Bas Bleu! Being a British citizen and only being able to go home once a year; reading these comments makes me smile and feel as though I was home right now hearing the kettle on the boil!